But without him, Trump’s immigration agenda could get greedier — and sloppier. Jeff Sessions’s resignation as attorney general Wednesday, the day after the 2018 midterm elections, was only surprising in that it took nearly two years. President Trump soured on Sessions — an early champion of Trump and key campaign adviser — weeks after the attorney general was sworn in, as soon as Sessions announced he would recuse himself from the ongoing federal investigation into ties between the Trump campaign and Russia. 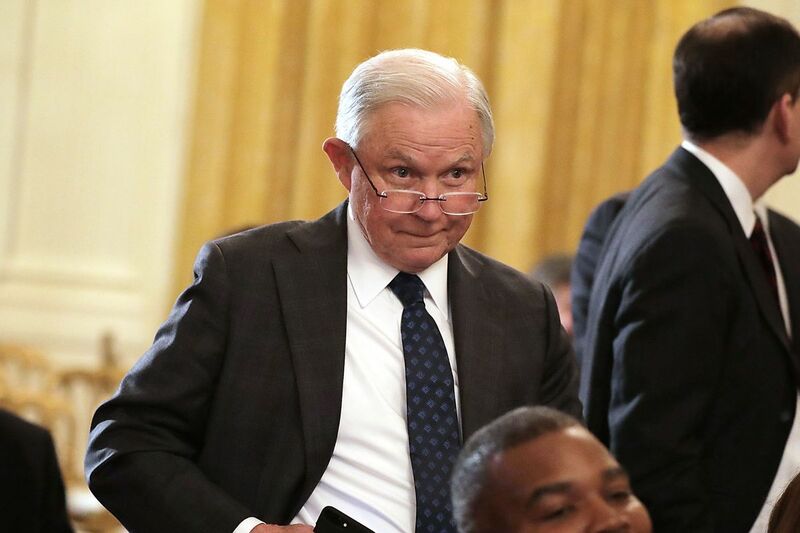 But it’s just as remarkable that in less than two years, Sessions managed to totally overhaul much of the Justice Department’s work on immigration and criminal prosecutions: turning even minor immigration offenses into a high priority for federal criminal prosecution while revamping the DOJ-run immigration court system in a way that encouraged assembly-line deportation orders. The irony of Trump’s contempt for Sessions is that Sessions was more productive than anyone else in Trump’s Cabinet during the time he was in office, and it’s barely even close. (The only challenger, former Environmental Protection Agency head Scott Pruitt, seemed to waste too much time on scandal to reach maximum efficiency.) And he did far more to turn Trump’s signature agenda item — an immigration crackdown — into a reality than anyone else. The changes that Sessions made to immigration policy will almost certainly outlast him; it’s going to be difficult for any future Democratic attorney general to undo much of what Sessions has done. But what made Sessions such an effective immigration-hawk-in-chief was his attitude toward policy change. He was aggressive in finding places where the executive branch had a great deal of discretion to make it harder for immigrants to come or stay; at the same time, though, he generally eschewed the rash and sloppy approach that got the administration into trouble with the courts and the public when immigration policy changes weren’t well thought-out in advance. Sessions’s successor (temporarily Matthew Whitaker, his former chief of staff) might be able to keep advancing Sessions’s agenda by copying the tactics Sessions has already used, but it’s unlikely that any future attorney general will have both Sessions’s drive to restrict legal and especially unauthorized immigration and his mastery of how to do it. This doesn’t mean that life will get any easier for America’s unauthorized immigrants or those seeking asylum here. To the contrary. At a minimum, the assembly-line immigration court system will remain. At most, the administration will keep Sessions’s hawkishness without his careful interest in staying, at least arguably, within the letter of the law. Trump made an immigration crackdown a priority. Jeff Sessions made it a reality. Immigration policy is generally associated with the Department of Homeland Security, which oversees both immigration enforcement at the border and the interior and the legal immigration system. But the Department of Justice oversees the immigration court system — which gives the attorney general an entree to make immigration policy and to manage its execution. Sessions, in his 22 months in office, put in place several policy changes that substantially increase the pressure on asylum officers and immigration judges to expel immigrants without papers (whether asylum seekers caught at the border or unauthorized immigrants arrested by Immigration and Customs Enforcement while living in the US) coldly and efficiently. The immigration court is crushingly backlogged — a problem that has gotten much worse under Trump. That makes it nearly impossible to swiftly deport an immigrant arrested in the US, or an asylum seeker who’s been allowed to enter after passing a screening interview. During his stint as attorney general, Sessions hired 126 new immigration judges. Nearly one-third of all current immigration judges are Sessions appointees. Not all of them are Republicans or immigration hawks, though most have experience as prosecutors — but all of them have been trained by a Department of Justice that is skeptical of “dirty immigration lawyers” and on the lookout for fraudulent asylum claims. The backlog has swelled nonetheless, though — by design. Sessions worked to make it harder to end cases in a way that was favorable to the immigrant, while pressuring judges to end more cases more quickly — leaving them few options but to rule against immigrants without much consideration. Sessions’s primary tactic in this regard was wielding a rarely used power of the attorney general: referring cases to himself from the Board of Immigration Appeals (the quasi-appellate body of immigration judges) and issuing new precedents by fiat. Sometimes, this directly increased judges’ caseload. With one ruling, he opened the door to reopening 340,000 cases that had been closed; with another, he reduced judges’ ability to delay resolving a case while an immigrant’s application for legal status was being processed. At the same time, using “performance measures” that immigration judges attacked as quotas, he pushed judges to resolve cases quickly. In other words, he created a system that pressured judges to order immigrants deported. The system has shown early signs of working in the way Sessions intended — judges are already much less likely to approve asylum seekers for “credible fear” than they were at the beginning of 2018. It might take years to know for sure how well Sessions’s gambit is working out — but at a time when a lot of immigrants in deportation proceedings might be eligible for legal status (either because they arrived seeking asylum or because they are longtime residents of the US), they’re a lot less likely to get their day in court. Sessions might have been a moderating influence on Trump’s immigration policy. We’re about to find out. Sessions’s timing makes sense from a political standpoint. But he’s leaving in the midst of a policy crisis that he was better equipped than anyone remaining in the Trump administration to find a way out of. Sessions has already done quite a bit to restrict asylum seekers’ ability to remain in the US, and to limit their options while they wait for their case to be resolved. The most famous of these moves is his June decision in Matter of A-B-, which substantially narrowed asylum seekers’ ability to claim asylum based on domestic or gang violence. Using the same mechanism — referring cases to himself for review, and issuing new precedents from his office — Sessions changed (or has set up Whitaker to change) policy on everything from whether immigration judges even have to consider an asylum application to whether asylum seekers can be denied the opportunity to post bond, rather than being detained throughout their proceedings. And while Sessions’s DOJ didn’t have a great track record of defending Trump’s immigration actions in court, for the most part, it did navigate the resolution of the family separation lawsuit this summer so that the administration can force a family to choose between separation or indefinite detention. The administration isn’t currently forcing that choice — it’s simply releasing families from custody — but it’s considering adopting this “binary choice” policy as part of its continued crackdown. But Sessions’s DOJ was also the force behind a more permanent and sweeping regulatory change to asylum law — one that was reduced substantially from the time Vox saw an early draft in June but that was in the later stages of consideration as of October. A few provisions of that regulation appear to have been the seed for the plan the Trump administration is now expected to unveil: a “travel ban”-style proclamation to bar immigrants who arrived between ports of entry from seeking asylum, and instead redirect them into “withholding only” proceedings with a higher burden of proof and no chance at permanent legal status. That plan embodies Sessions’s approach to immigration policy: pushing the executive powers of the attorney general to their utmost point, while following the standard process (or at least not violating any processes directly). It’s a needle that few other members of the administration appear able and interested to thread. Other immigration hardliners in the Trump administration don’t have much policy experience (John Kelly, Kirstjen Nielsen) or are more reckless than pragmatic (Stephen Miller, John Bolton). It’s weird to think of Sessions as a moderating influence on immigration after he spent his career as the lone outspoken restrictionist in a pre-restrictionist GOP. But procedurally, that’s the role he may have played. The Trump administration’s immigration record is currently defined by a pair of policies that were horror shows in implementation: the travel ban and family separation. Jeff Sessions’s DOJ was less flashy but more effective. MW and Beezer like this. President Trump and America owes Jeff Sessions a lot of gratitude for what he's done. However, instead of gratitude he gets kicked to the curb like week old trash simply because Trump is afraid of something being revealed during the Russia collusion probe. It's disgraceful how badly Trump has treated Jeff Sessions. Heck, they wouldn't even honor his request to finish out the week! Totally disgraceful and very undeserved. In view of what Sessions accomplished over less than two years, just imagine what he could have done over a full eight years! Trump may consider himself a winner by forcing Sessions out, but there is no doubt in my mind that the rest of the country will end up losers because Trump couldn't get over his obsession with the Russian collusion investigation. What's he afraid of?